Sony Electronics is a Japaneses company that manufacture a wide variety of consumer and commercial products. Their video solutions are designed to provide superior quality images. Sony manufactures multiple home theater projectors. With features such as 4K SXRD technology (see below), 3D capability. 120,000: dynamic contrast ratio it's no wonder they create such stunning images. Turn your wall into a life-size window to another world. Be moved by beautiful scenery, art, movies or sports with an expansive 147-inch image and four times the clarity of Full HD1. Your room becomes an extraordinary space—you might just forget you’re at home. This projector is great for gaming and other specialty rooms where space or the shadows created by traditional projectors is an issue. 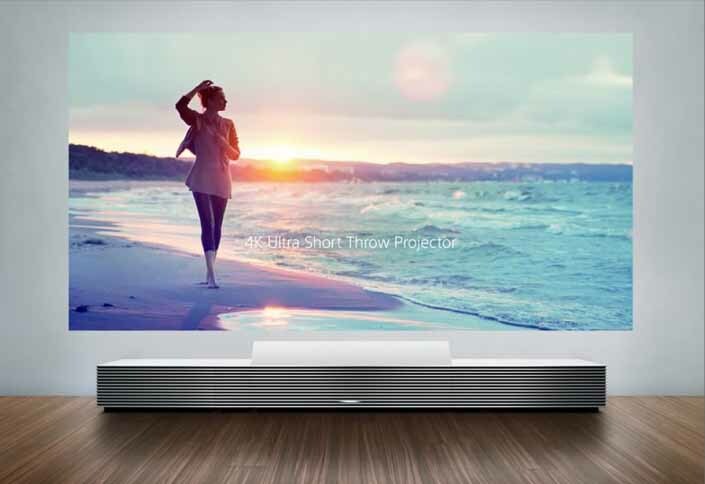 4K SXRD™ technology from Sony is the new way of projection, offering far more resolution than the old way: the 2K DLP™ chip. The SXRD acronym stands for Silicon X-tal Reflective Display, where X-tal is a common abbreviation for Crystal. This is an all-new approach to reflective liquid crystal microdisplays. Sony's design maintains a uniform, ultra-thin liquid crystal cell gap without any spacers in the image area. With such a small gap, SXRD technology produces superb contrast. Sony also uses a Vertically Aligned Nematic (VAN) liquid crystal that changes state with amazing speed. This enables Sony's SXRD microdisplay to run as fast as 200 frames per second while minimizing image smear. The thin gap and VAN liquid crystal enable Sony's SXRD technology to project images of a quality surpassing DLP projectors. For extended service life, Sony also incorporates an ultra-stable inorganic alignment layer. And unlike conventional LCoS panels, which are notoriously difficult to manufacture, the SXRD panel uses a production process that was perfected in Sony's own, dedicated manufacturing facilities. Full HD brightness and clarity for every room in your home. Sony's top-of-the-line TV for premium picture quality and elegance. 4K Ultra HD is four times the resolution of Full HD 1080p1. But with Sony it is so much more. With almost a decade invested in 4K and over 15,000 movie theaters worldwide using Sony 4K Digital Cinema projectors, no one else is more dedicated or experienced at delivering 4K Ultra HD entertainment than Sony. Now the largest collection of 4K feature films and TV episodes for the home is available exclusively for Sony 4K Ultra HD TVs with our 4K Ultra HD Media Player2. Sony’s 4K TVs upscale all of your existing sports, TV shows and even YouTube® clips with the 4K X-Reality™ PRO picture engine. Sony 4K Ultra HD TVs are ready for the future of 4K entertainment. 2014 models already support the latest HEVC video compression format that will be used in current and upcoming 4K streaming video services like Netflix. No additional update kits are required. Additionally, all Sony 4K UHD TVs support the features defined in HDMI 2.0 like 4K/60p playback, which will support various external media players and will be critical for viewing sports in 4K Ultra HD in the future. View higher peak brightness and deeper blacks than we’ve ever produced before. See a brightness range up to three times brighter than a conventional LED TV without sacrificing black levels using Sony’s exclusive X-tended Dynamic Range PRO technologies. To learn more about Sony products, please fill out the form.